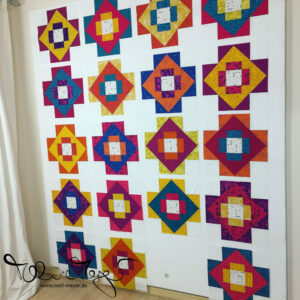 I am currently trying to catch up with my two big projects – the technicolorgalaxy Skill Builder BOM Quilt from Pile O‘ Fabric and the aviatrix quilt from Oh Fransson. Here are my latest progress pictures. For the aviatrix I have now finished 7 of the x and plus blocks for border 3. And these are the piano key blocks for the third month (april). 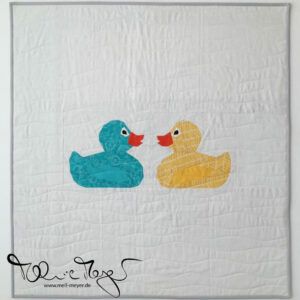 In terms of piecing just a bit behind but so terrified of deciding on the QAG method for quilting. Any encouragement or advise? And of course I have started a new (bag) project with these fabrics. More on that probably next week. Sneak Peak: It is going to be a Poolside Tote from Noodlehead. You really have a lot of bright and beautiful projects underway! 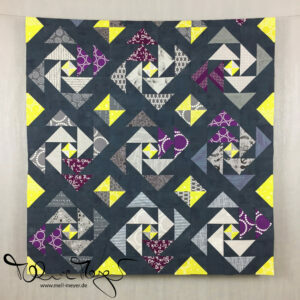 I have only tried out quilt-as-you-go once (I assume that is what QAG is! ), just some practice squares linked together with sashing. It was quite straight forward, though I do not usually use the technique because I found I can generally manage quilting the size of the quilts I make and don’t usually want sashing on my quilts. I know there are techniques that do not require the sashing. But at least based on my experience, the technique is nothing to worry about. Have fun! You may end up liking quilt as you go. You work on much smaller, easier-to-manage blocks. The only draw back is putting together the pieces and covering the seam lines that result. I have mostly done that part by hand, but I believe there is a way to do it by machine. I enjoy the fact that with quilt as you go, when you finish joining up your individual blocks, you need only add a binding and your quilt is done! Good luck. Love the colours for your Aviatrix and Technicolour Galaxy! I love the idea of QAYG because moving a big quilt under the machine is a whole other level of quilting than just bits at a time. It feels like eating the burger in bites intsead of the whole thing at once. I view it as the perfect way to practice and the perfect way to build confidence. I’ve got my eye on that pink AG fabric… love!! !